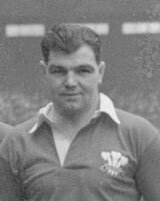 Bill Tamplin played seven times for Wales as lock and place kicker immediately after World War Two, turning out for Cardiff at club level after appearing for Newport before the interruption. His best years were lost to WW2, but he was picked for three games in the 1947 Five Nations. On his debut against Scotland he kicked two conversions and a penalty, and in the next match kicked the only score of the 3-0 win over France. In December he was chosen to captain the side against the Australians and led them to a memorable 6-0 win, again kicking all the points himself. He retained his place for three matches in 1948 but was dropped after the humbling home loss to France.